Adventure is the bread and butter of entertainment from generation to generation. Tales of adventure also come in many different forms, especially in video games. And, although I have experienced a plethora of adventure throughout my years of gaming, there’s one genre that I had always lightly touched: the point-and-click adventure. I had always been turned off of playing one since “full control” over the character was off limits aside from moving up, down, left and right. It wasn’t until The Walking Dead: The Game that I had actually tried one. Since I enjoyed that title immensely, I felt the need to play another point-and-click; this lead me to play Jolly Rover. I knew certain themes and gameplay elements were going to be absent from Jolly Rover, but just playing another game in the point-and-click genre sounded enticing. So, I set sail in a world of dogs, pirates and the Seven Seas! In Jolly Rover, you fill the shoes of Gaius James Rover. James is a pup, chef, and clown by trade who gets tasked with delivering barrels of a rare form of rum to the governor of Groggy Island. While en route to Groggy Island, the poor seadog gets taken over, and all of his cargo stolen. Once he awakens, you come to find out that you’re also being held captive by the pirates. It’s a classic introduction that has been done before, but it had me hooked and interested in James’ tale. Even past the introduction, the game kept me pretty steadily hooked thanks to the excellent writing and pacing done by the team at Brawsome. You’ll be traveling to many locales, and, even if the good majority of the ten-hour campaign is spent on Groggy Island, I never felt as if my time spent elsewhere had been too short. Like I mentioned, the pacing is great, despite the story’s tendency to sometimes lack in originality. One thing noticeable as soon as you start Jolly Rover up is the excellent visuals. 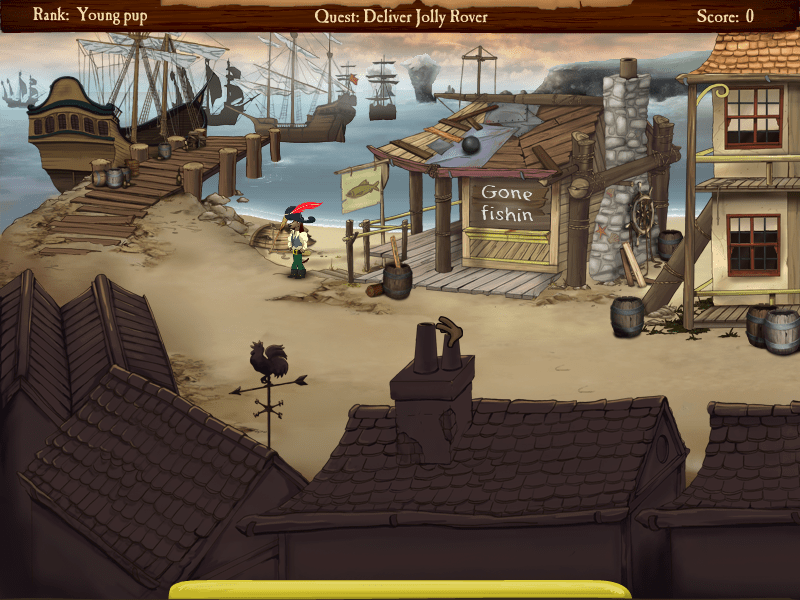 All of the game’s graphics are hand-drawn by some very talented designers that give Jolly a very unique look. 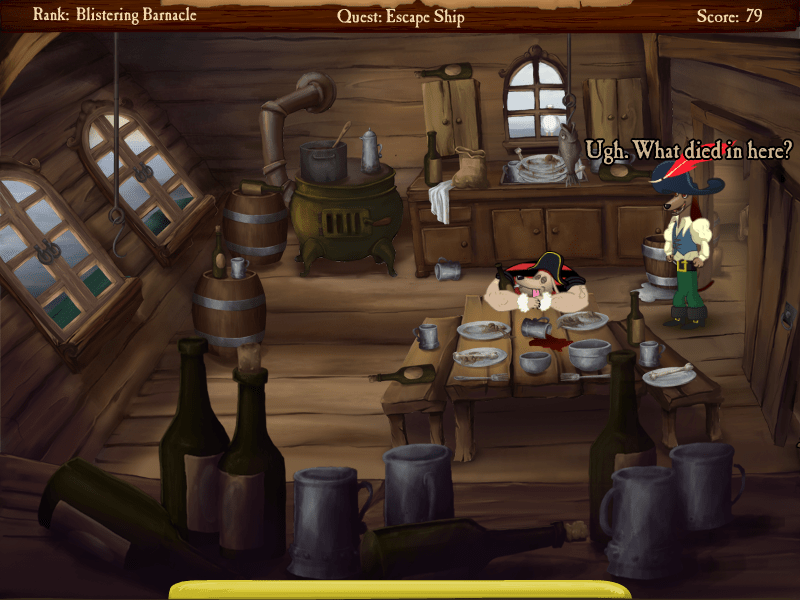 Everything from the rundown dump that is Groggy Island to the cute character design; the game is aesthetically pleasing. 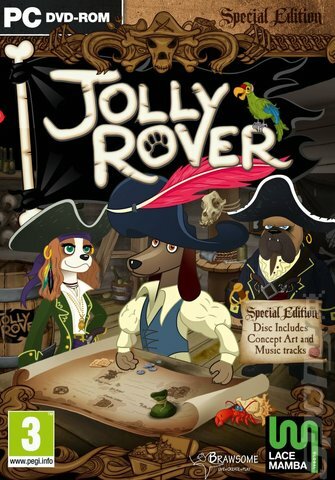 If you just look at the surface of Jolly Rover, the game appears to be tailored more towards children or a younger audience, but delve a litter deeper, and you’ll be shown otherwise. The forestry is beautifully illustrated. Humor is one of the driving forces behind Jolly Rover, and it can be rather suggestive at times. It’s never obscene, but could catch one off guard if expecting a full-blown child’s game. Otherwise, the game is full of comedic moments that should put a smile upon the faces of all ages. I even found myself jotting down some of the puns and jokes, or revisiting certain areas to hear James’s comments again. One area in which the comedy shines is the ever-changing objective found at the top portion of your HUD. Depending on how a conversation goes, your current objective will reflect what James is thinking at that very moment. It’s hilarious, and had me looking forward to each and every conversation. Now, even though I found enjoyment in the good majority of the jokes, the humor can be rather cheesy in certain situations, and, more than a few times, I even cringed, but it never ceased my motivation to finish the title. Brawsome also did a marvelous job in the sound department of Jolly Rover. Every single character is fully voice acted, and done well. Some characters are voiced by the same actor, but the slight change each actor delivers within their roles helps differentiate the characters from each other. The music within the game is also done well. While it never had my feet tapping, besides one of the tracks found later in the game, the score fit the theme of pirates perfectly. Hmm… I’ll just ignore every single one of these useful items. 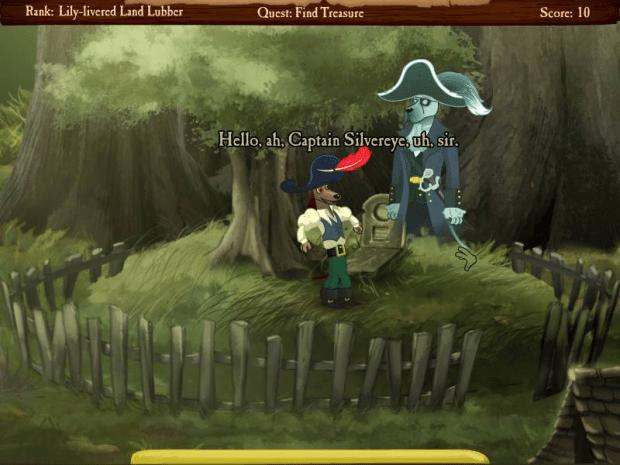 Pointing and clicking, finding items, solving puzzles – Jolly Rover has everything that makes a point and click adventure game great. Throughout the game you’ll be tasked with solving various puzzles which come in the form of simple item combining, memorizing, and collecting formats. Any items picked up will be found in your loot menu – accessible by moving your cursor to the bottom hemisphere of the screen. Once in the loot menu, you can click on the item, and combine it with another item in the menu, or you can use it to interact with something in your current location (door, NPC, etc…). Some of these puzzles are incredibly easy, while some try too hard to be challenging. For instance, when you are tasked with waking the chef to get a bottle of rum, it requires an elongated task that I found rather annoying. It didn’t help that there was an abundance of items that could have easily been used to wake him in the room he was in. One other annoyance during my time with Jolly Rover was the movement speed. There are more than a few occasions where the player is required to backtrack when solving a puzzle, and the adrenaline rush from finally finding the solution diminishes due to the snail’s pace at which James moves. It could just be me, but I was taken out of the moment quite a few times during my play through because of this. Thar be hidden treasure in dem trees. 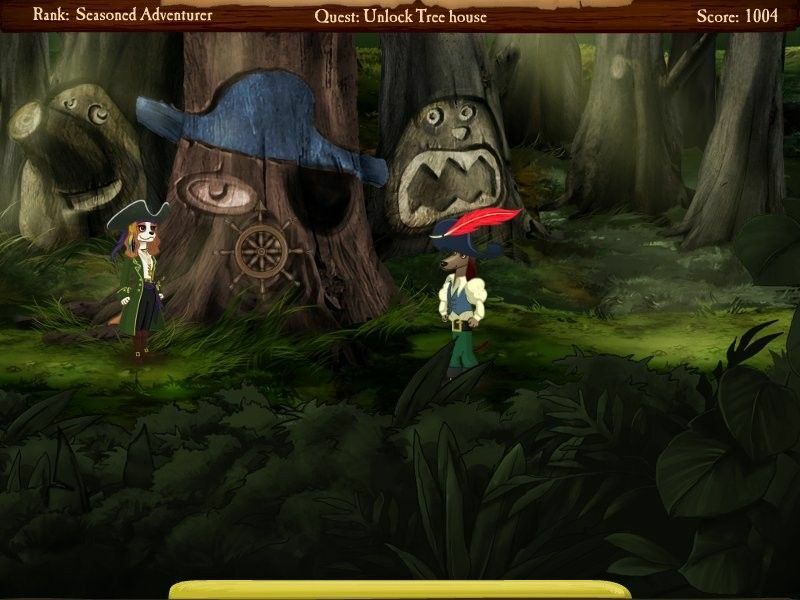 Found hidden in many of the games screens are crackers, pieces o’ eight, and pirate flag pieces. 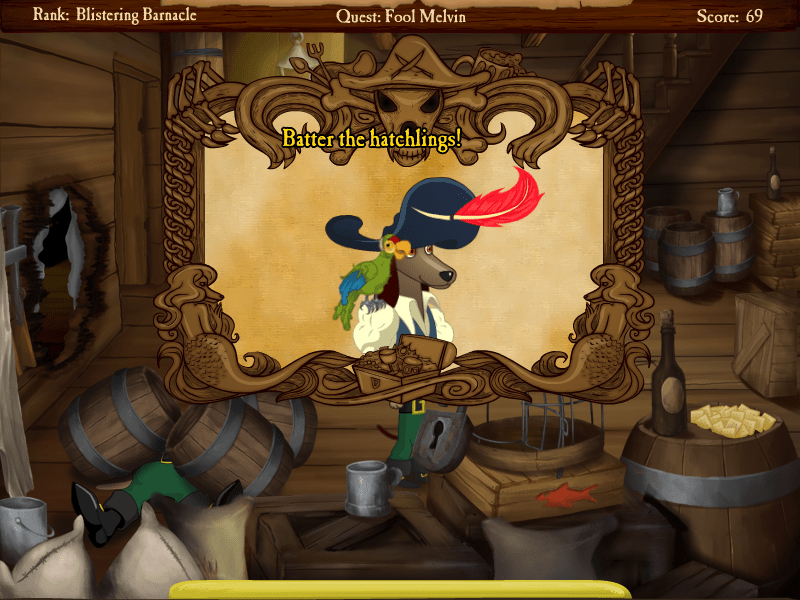 Crackers allow you to get hints from your companion parrot, Juan; pieces o’ eight can be used to bribe certain NPCs and buy necessary items; and pirate flag pieces are strictly for collecting purposes. Each item also unlocks various music tracks, captain bios and concept art, as well as increases your score and rank. Anything that is unlocked can be viewed in your log, which is found in the options menu. The way you go about getting these items is by interacting with everything within the environment. To help you out, the space bar will highlight everything that can be checked in the area. This addition is much appreciated due to the fact that continuously scanning the environment can become redundant. Sadly, I hadn’t found this out until after I hit the game’s conclusion. It’s a good thing, though, because I was motivated to fire up a new game to see what exactly I had missed. Jolly Rover for me was a fun and comedic journey I’m glad I experienced. It definitely isn’t the best game I’ve ever played, but nor was it the worst. Sure, there were some annoyances and lack of originality at points, but I would still recommend this game to anybody in search of a casual, entertaining game. Best of all, it can be picked up DRM free for $9.99 on Brawsome’s website, or from steam for the same low price. Now, excuse me if you will, it’s time to set sail again. Previous Post:Skull Kid to Appear as Assist Trophy in Super Smash Bros.